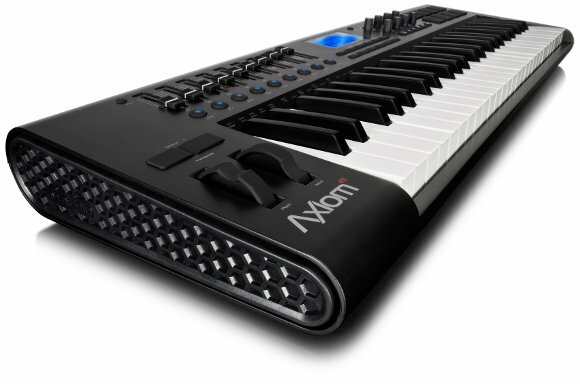 Avid is updating their M-Audio Axiom line of USB controller keyboards. New in this version is DirectLink, which provides automatic mappings for software like Ableton Live, Logic, Cubase, and of course Avid’s own Pro Tools, similar to what’s in the Axiom’s big-brother Axiom Pro. The controller itself has also been improved, with lower-profile faders on the 49/61 model, smooth rotary encoders (not knobs! ), an angled-up top panel so you can see what you’re doing more easily, and other tweaks. Perhaps the most significant feature is improved keyboard, with an updated semi-weighted action and adjusted playing angle. The updated Axiom enters a market that has been maturing recently – a market M-Audio themselves helped popularize in the first place with the Oxygen line. Novation has continued to update their Automap functionality and added a more inexpensive option in the form of the Nocturn controller keyboards. The Novations are nice, although I’ve heard a fair bit of frustration with the add-on Automap software that sits between you and the software you’re controlling; while it adds functionality, it also adds complexity, and I find it interesting that its rivals are going a different direction. I just got in a review unit for Cakewalk’s A-PRO series. (See Cakewalk’s current keyboard lineup.) Like the Avid units, it also adds automatic mappings without requiring extra software, supporting a number of hosts for Windows and Mac. 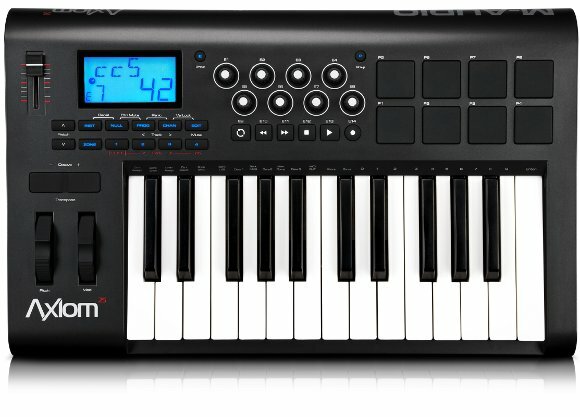 Also notable, Roland has added their higher-quality semi-weighted action, so that instead of feeling like a cheap plastic controller keyboard, you get the solid “clunk” in the action that previously was reserved for standalone synth products – without paying much of a premium for the privilege. I’ll be interested to feel how the new Axiom action stands up, as the Axiom Pro keyboard also feels pretty good. I expect the Axiom will be competitive on price and likability, certainly. I asked some follow-up questions with Avid spokesperson John Krogh last week, including an explanation of what the heck the difference is between Axiom’s DirectLink and Axiom Pro’s HyperControl – each methods for zero-config control of your favorite host and instrument software. CDM: Okay, I’ll bite. DirectLink? HyperControl? What’s the difference? John at Avid: It’s fair to think of DirectLink as a subset of what HyperControl is. There are some similarities: With both technologies, the keyboard faders, knobs and transport buttons get mapped to mixer channels, pan, and transport controls within compatible DAWs. That’s sort of “basic” mixer mapping. The new Axioms with DirectLink also feature an Instrument Mode that, when engaged, will instantly map the faders and knobs to meaningful parameters on software instruments within compatible DAWs. This mapping relies on Axiom Instrument Maps, which are essentially preference files for the built-in software instruments included with Logic, Live, and the rest of the DirectLink-compatible DAWs. The thing with the Axiom Instrument Maps is that they’re set up to provide consistent, intuitive access to the most commonly used plug-in parameters. For example, filter cutoff will always be located on the same knob, regardless of the instrument selected, so the experience is more like working with a hardware synth where there are dedicated physical controls for the parameters you’d want to tweak in real time. In general, parameters such as filter cutoff and resonance get mapped to the knobs, and ADSR controls get mapped to the faders (e.g., amp envelope ADSR will map to faders 1-4, filter envelope ADSR will map to faders 5-8). Currently, there are Axiom Instrument Maps for the built-in software instruments in 3P DirectLink DAWs. More mapping “profiles” will be added over time for third-party software instruments. For software instruments without Axiom Instrument Maps, DirectLink will automatically map the encoders to the first 8 parameters that are published to the host software, and users can use MIDI learn to re-assign how these are set up. Note that this kind of predefined mapping is only available to software instruments, not plug-ins. That’s one of the big differences. With the Axiom Pro and HyperControl, you’re able to access every software instrument and plug-in effect parameter – not just a fixed number of controls for software instruments (which is limited to the number of faders and knobs on the Axiom keyboard). On the Axiom Pro you can page through every parameter, so there’s no limit to the number of parameters you can access. HyperControl on the Axiom Pro also provides a lot more feedback on the LCD, and adds QWERTY key command support (ability to assign QWERTY keystrokes to pads and buttons). There isn’t a public SDK, but we’re “open” in the sense that we don’t limit DirectLink to specific third parties. We’re willing to work with any third-party DAW developer if they’re interested in adding DirectLink and/or HyperControl support. We just happen to have existing developer relationships with Apple, Ableton, Propellerhead and Steinberg, and we work with each 3P developer on their integration of DirectLink/HyperControl. CDM: Is the keybed comparable to any other M-Audio keyboards, or is it new? John: It’s a new keybed that offers a weightier feel compared to the original Axiom (it’s not the Tru Touch keyboard found in the Axiom Pro). So, there you have it. The “Pro” still has more sophisticated control options, a more serious action, and of course Speed Racer-white styling, but the standard Axiom looks competitive now, too. What’s your controller keyboard of choice? How has your experience been with what you’ve owned? What’s important to you when making a decision – that is, what do you want to know? (We’ve gotten a number of requests from readers wondering what to get, but that can depend on what variables matter most to you personally.) Let us know in comments.